For many people, the heart of the home is the kitchen, but this is a room that’s often overlooked when it comes to design. Often our kitchens are white and neutral with design as an afterthought. Reform wants to change this and collaborate with the best Danish and internationally acclaimed architects to reform our kitchens – and our everyday lives – with great design. Reform projects start with a basic ingredient – elements from the IKEA kitchen. Add their architect-designed fronts and countertops to create an aesthetic and a personal style that combines quality construction, function and timeless design. In this new design Reform has collaborated with one of the top architecture companies when it comes to circular economics in sustainable buildings around the world, Lendager Group about the design. Lendager Group has exclusive rights to use the surplus wood from Dinesen, which was the last little part that made this collaboration a perfect fit. In an exclusive company like Dinesen, customer-specific solutions are produced, which generates large amounts of residual wood. Therefore, the kitchen consists of cuts that are left when Dinesen has supplied floors to galleries, restaurants, mansions, and the like - which combined with its positive impact on the environment only enriches the story of the design even further. One of my favourite home-ware stores! All their products are ethically produced with a touch of rustic minimalism, and are all unique - handmade by talented artisans using traditional skills passed down through generations. Particularly loving these new and beautifully handcrafted Myung vases are made from two-tone black and natural bamboo and are just perfect to display all your foraged twigs gathered from your walks in the woods. That is certainly how I am using mine! I only just realised these guys are just 10 minutes away from me and they hand make the most beautiful soy wax candles poured in recycled contained such as old jelly moulds, jam jars and even yoghurt pots! Used to make conserves during the summer months these are made incredibly well and date from anywhere between the 1940s-1970s. The Botanical Candle Co. have given them a new life as a beautiful soy wax candle but once the candle is burned down they can be easily washed out and put to another use. 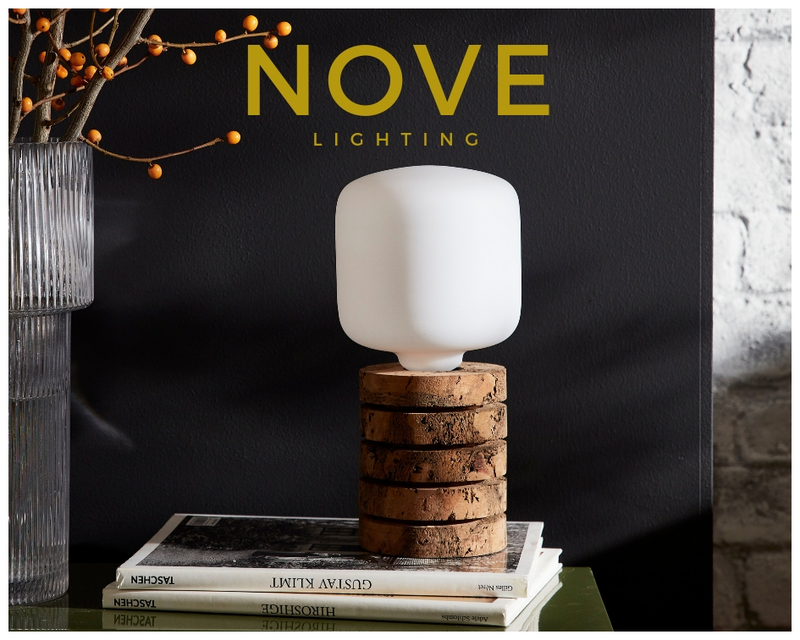 New to me, Nove is a sustainable lighting brand created by interior stylist and designer Kirsty Saxon. NOVE is dedicated to the design and development of lighting using natural materials such as cork which has been making a huge come back in the design world those past couple of years as an eco friendly material. They have just added this new range of table lights and I am obsessed! 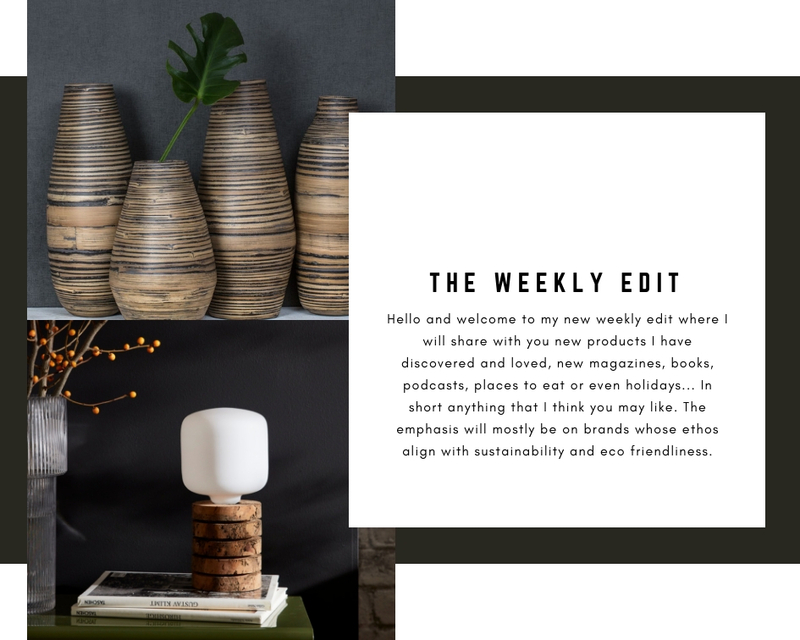 Kirsty says: “Each of our new table lights is thoughtfully crafted from a single block of either marbled or blackened cork, which involves a skilled, labour-intensive process of precision and craftsmanship which remains at the heart of every piece we make. Our contemporary designs are further enhanced by the customisation of contrasting solid brass with chamfered edge detailing, bringing a cool, soft glow to our lamps. “The new table lights collection features two unique designs; The Table Light and The Stacked Light. The Table Light features a sleek, simple column of beautiful marbled or blackened cork and is finished with an elegant chamfered, weighted solid brass base.